Victoria Zegarelli (@nailbarlounge) of Nail Bar Lounge in Long Island, N.Y., shows how to make this gilded nail design fit for a bride. 1. Paint the nail with a white gel-polish. Cure and wipe off the tacky layer. Place a strip of silver striping tape down the center of the nail. 2. Apply a thin coat of gel base coat over the right side of the nail and cure. Paint swirls on the side using white gel and cure. Continue building on the swirls. 3. Place a piece of white gold foil over the right side and rub. 4. With a similar metallic gel-polish, fill in the spots that couldn't be reached with the foil. Cure and wipe away the tacky layer. 5. On the left side, draw swirls similar to the ones on the right. Continue to build them up so that they are the same height as the other side. 6. 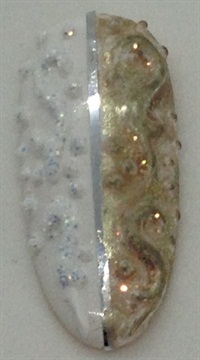 Before curing the last layer, sprinkle a white glitter over the left side of the nail. Cure in lamp. White a soft bristle brush, lightly brush off the loose glitter. Apply a thin coat of matte top coat over the entire nail to seal in the design.